Why not visit beautiful Sicily whilst on holiday in Malta? For tours to Sicily the port tax and other surcharges are not discounted. Optional Pick Up/Drop Off: The Catamaran departs from Marsa harbour, therefore unless you have a car to get to/from the port you may want consider pick up and drop off transport. You can pre book your pick up/drop off by selecting 'Transfers to/from port' from the BOOK YOUR TOUR panel when booking. Optional transfers must be booked at the time of booking and cannot be added after the booking has been made. Pick up's start 1hr 30min to 30 minutes (depending on pick up location) before the catamaran departure time. Transport will pick up from most hotels and central pick up points, such as banks, churches and other prominent places. Transport does not pick up from private residences, but we will allocate the closest pick up point. The actual pick up time and location will be printed on your service voucher. Alternatively you can make your own way to the port in Marsa (limits of Valletta). If you decide to make your own way details of how to get there will be provided on your tour voucher. Port Tax: This is a complusory charge and is already included in the tour price. This is a compulsory tax which varies depending on the tour. The tax is already included in the price of the ticket on this website. Ticket resellers must advise you of this charge at the time of booking. Local Sicilian guide accompanies the tour for the full tour duration. You will meet the guide on arrival in Sicily. Documentation: Passport or ID required. Each passenger must provide passport information/ID details during the booking process, so have these ready when you are booking. When booking a Sicily tour you will need passport or ID information for ALL passengers to complete your booking. You are also required to take you ID or Passport with you on tour. Operates on Wednesday, Friday & Sunday between October 1st and April 30th. On arrival at the port you will check-in and board the catamaran. The crossing is estimated to take 90 minutes, however this can be slighlty longer on occassions, depending on weather conditions. Our tours takes the eastern route passing Noto, Syracusa and Catania en route before arriving at Mount Etna, Europe's most active volcano. 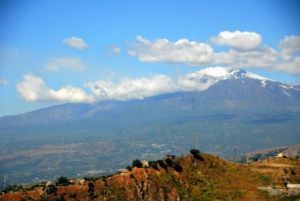 NOTE Our visit of Mount Etna will take you to 2000 metres above sea level, stopping at Silvester Craters. If you would like to visit the peak of the mountain and there is enough time to do this (you must check with your guide first) optional cable car and 4x4 truck/jeep tours are available, cost varies from €30 to €60 per person depending on which option you decide to take. Our next stop includes a visit to the Baroque city of Modica to enjoy some time in the city centre and the popular "Il Corso". Modica once so important as to constitute a kingdom within the kingdom, is today a prosperous town still dependent on its traditional agricultural economy. The beautiful flight of steps leading to the main entrance and the statues representing the twelve apostles are the main features of S. Pietro's church. The main street or "Corso", with it's mixture of magnificent buildings, modern shops and al fresco cafes.It is a thriving town centre. You will return back to the catamaran for the return crossing to Malta, arriving at 2100hrs (based on a 90 minute crossing). Transport will be waiting for you to return you back to your hotel. The catamaran is equipped with toilets, a gift shop and a cafeteria serving a good variety of drinks and snacks. Please note!During the winter months the tour routing may have to be changed due to adverse weather conditions. Whenever possible you will be advised of such changes, however in certain circumstances we may forced to change the tour routing during the actual tour. These situations are beyond our control and enforced onto us by local authorities. The operators of the tour and Malta TravelNet will not under any circumstances be held liable to any refunds or any such type of compensation in the even that this may happen. This was a lovely day and a good introduction to Sicily. The coach was very comfortable and the guide was excellent. The driver was equally good. The day is long but we knew that in advance, and were well prepared. There was plenty of time to explore and to find nice places to eat. We added in the cable car ride up Mount Etna and it was well worth the extra cost. Pick up was on time and set down was as described. Thank you Discover Malta! Tour was well organised and very interesting! Long day, but everything was perfectly scheduled with great guide, driver and coach making for a very enjoyable tour. We thoroughly enjoyed the tour despite the inclement weather. We knew that Mount Etna would be in cloud so weren't disappointed when we got there, it's still spectacular. We went up in the cable car and it was snowing up at 2500 mts which was fun! Enjoyed lunch at the cafe and sampling all the delicious produce at the craft shop before going back down in the cable car. Modica is a very scenic town, and very interesting. There's some beautiful architecture in the Old Town area. We enjoyed a lovely dinner before heading back for the bus. The whole trip was good value and very worthwhile. Very well organize and the guide was very helpful and friendly guy.Impressive trip to Etna Volcano and the city of Modica, meet our expectation! !We recommend to everybody Malta Travelnet!! 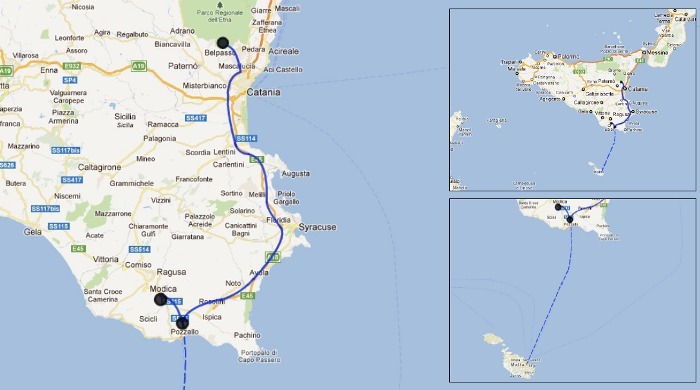 This was a fantastic trip, we went on the catamaran which is quite fast and comfortable, was met by the guide at Ragusa and had an enjoyable trip to Mount Etna and Modica. Guide was very nice and friendly and we got quite a few tasters on our stops which was great. Would recommend definitely just prepare yourself for a long day. Everything went well except that the stop before Etna could have been a bit longer. It took all that time to queue to the toilets as there aren't any except in cafes and restaurants! The overall tour was excellent, organisation and help prior to booking but i have to say that the guide did make us feel very humiliated when we returned to the bus late, we underestimated the return time from the top of Etna and were late back along with another couple, the guide then proceeded to humiliated us over the microphone, not even asking for an explanation of our lateness, however this did not dampen the rest of our day and we enjoyed the remainder of the tour. Well organized tour. Etna was good but Modica was more interesting to me personally. Thanks! The organization of the tour was fine, everything was on the scheduled time, perhaps we would suggest to have one bus stop long before reaching Nicolossi, to have breakfast, taking in account that we woke up as early of 5 in the morning. We understand your point, however you must have known that a considerable time is spent on the bus because Sicily is a very large island. It is for this reason that the guiding is done enroute so when you get to the sites you have maximum free time to enjoy. Very nice trip but scedule was too busy in Etna. No time to eat propely and also siesta time in Italy close the restaurants in Modica. I enjoyed the whole experience of Mount Etna, but I felt that to be left on our own for two hours was unnecessary and a waste of valuable time. Not much to do unless you pay an extra 30 euros to go up on the cable ride. The visit to Modica was worthwhile, but once again we were left for two hours. I noticed another group of tourists being shown round the town by their guide - surely something to consider in the future. Our guide delivered us to a chocolate shop, but failed to tell us that there was a museum of chocolate in the town - free to visit and a history of chocolate making to boot Sicily is such a beautiful island and I feel that much more could be made of the time available which would paint a much better picture of the island - less time at Mount Etna, and a slower journey through some of the towns to sample the unique buildings and quality of Sicilian life. Disappointed that the first village shop was to quickly direct us to one specific vendor off in a park who charged more for the same items than the vendors set up in the village green where there was entertainment. And then to not have enough time to really visit those other vendors. Also disappointed that one had to pay an additional 30 Euros to take a cable car up to the actual volcano on Etna. And, although impressed that the Italian tour guide could speak English and German fluently, he spoke so fast and somewhat muffled that he was hard to understand. On the other hand, the 200 mile tour through Sicily was enjoyable in order to get a glimpse of the island, and the town of Modica was very charming. Again we were herded to one chocolate shop whose prices were higher than competitors, but we at least had time to "shop around" and venture more on our own. Thank you for your comments. I would however like to point out a couple of things that have nothing to do with tour that you booked. Tourist traps can be found all over the world and Sicily is no exception, at the end of the day it is your choice if you want to purchase from such places. With regards to the additional cable car that you decided to do, that is something optional which you choose, it does not form part of the tour. In fact you are lucky that you had the time to go all the way to the peak of the mountain...well done to the guide for making this possible! The description on the website is very clear that you visit Sivestre Craters on Mount Etna it does not state that you visit the peak of the mountain. There is plenty to see and do at these craters, so going higher up the mountain is down to the individuals choice. Loved every minute of the tour! We had a wonderful bus driver and an excellent guide. The coach was clean and comfortable. I learned a great deal about the produce grown in Sicily. The trip to Mount Etna was awe inspiring! I very much enjoyed the stops in such quaint, historic towns. Very satisfied. Good day trip. Saw a lot and enjoyed the ride. The ferry across was great. Malta Travelnet's services were excellent!